Notable Civil War historians herein continue the evaluation of select commanders begun in The First Day at Gettysburg: Essays on Confederate and Union Leadership. Using fresh manuscript sources coupled with a careful consideration of the existing literature, they explore issues such as Robert E. Lee’s decision to renew the tactical offensive on July 2; James Longstreet’s effectiveness in executing Lee’s plan; the origin and impact of Daniel E. Sickle’s decision to advance his Third Corps, which formed the infamous “Sickle’s Salient”; the little-understood role of Henry W Slocum and his Union Twelfth Corps; and the contribution of John C. Caldwell’s division in the maelstrom of the Wheatfield. 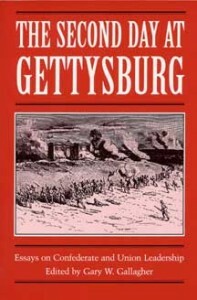 Provocative and occasionally at odds with one another, these essays present new evidence to expand understanding of the battle and offer sometimes controversial interpretations to prompt re-evaluation of several officers who played crucial roles during the second day at Gettysburg. Historians and other students of the battle who are not persuaded by all of the essays nonetheless will find they cannot lightly dismiss their arguments. Gary W. Gallagher is professor of history at the University of Virginia. He is a contributing editor of The Kent State University Press publications Antietam: Essays on the 1862 Maryland Campaign (1989); Struggle for the Shenandoah: Essays on the 1864 Valley Campaign (1991); The First Day at Gettysburg: Essays on Confederate and Union Leadership (1992); and Three Days at Gettysburg: Essays on Confederate and Union Leadership (1999).